The first 90-minute episode of Reporting America at War explores the relationship between the press, the military and the public from the Spanish American War through the Allied victory in World War II. 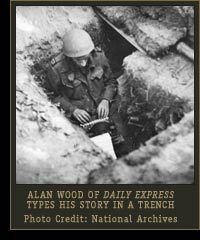 Through the experiences of veteran war correspondents and the observations of scholars, the challenges of battlefield reporting are brought vividly to life and the essential patriotism of the press in this period is illuminated. The film opens with a brief history of war reporting, then goes on to relate the exploits of Richard Harding Davis, the dashing and ambitious reporter who covered the Spanish-American War for The New York Herald. Among the first reporters to portray war as a grand adventure, Davis sought out military figures to cast as heroes in his stories. Foremost among them was Lieutenant Colonel Theodore Roosevelt, whose national reputation owed much to Davis's rousing account of the Americans' victory at San Juan Hill. Davis's views on warfare were later reflected in the reporting of World War I, when journalists cooperated with the government's propaganda campaign and depicted the conflict as a great crusade for democracy. As a result, the average citizen had no inkling of the extent of the slaughter until well after the war had ended. With this early 20th Century history as a backdrop, the program goes on to explore the coverage of the Spanish Civil War. The American correspondents in Spain saw the conflict as the best hope for stopping fascism, and their dispatches reflected this view. While extraordinary for its intimate portrayal of the bombing of Madrid, Martha Gellhorn's coverage was typical in its firm commitment to the anti-fascist cause, and the program explores her perspective on the conflict and its implications for the coverage of World War II. Of the American correspondents in Europe at the outbreak of the Second World War, it was Edward R. Murrow who best exemplified the trend toward committed journalism. In his now legendary broadcasts from London during the Blitz, Murrow not only conveyed the facts to his listeners, but also inspired empathy for the courage and suffering of the British people  thereby helping to pave the way for American involvement in World War II. When the United States marched into the conflict, the press was quick to throw its support into the war effort. Although journalists were subject to strict censorship  the country had been in the war for 21 months before photos of dead GIs were allowed to appear in print  the censors ultimately proved somewhat superfluous. As Walter Cronkite and Andy Rooney explain in the film, the shared belief in the rightness of the cause  and a feeling of solidarity with the military  often inspired journalists to censor themselves when the truth threatened to undermine public morale. Despite the absence of graphic detail, journalists managed nevertheless to create a vivid and moving account of the war. Foremost among them was Ernie Pyle, whose sympathy for the common soldier turned the GI into a national hero. Episode One explores Pyle's impact and the significance of his work for the national understanding of World War II. Pyle's death in the Pacific in the war's waning months serves as the dividing line in the relationship between the press and the military. In the years to come, romantic depictions of warfare would give way to a harsh and often skeptical realism, a transformation examined in Episode Two of Reporting America at War.